A review of the Captain Jack White book, Misfit (Dublin, Livewire Publications, 2005) by his son Derrick White. The review has never before been published. 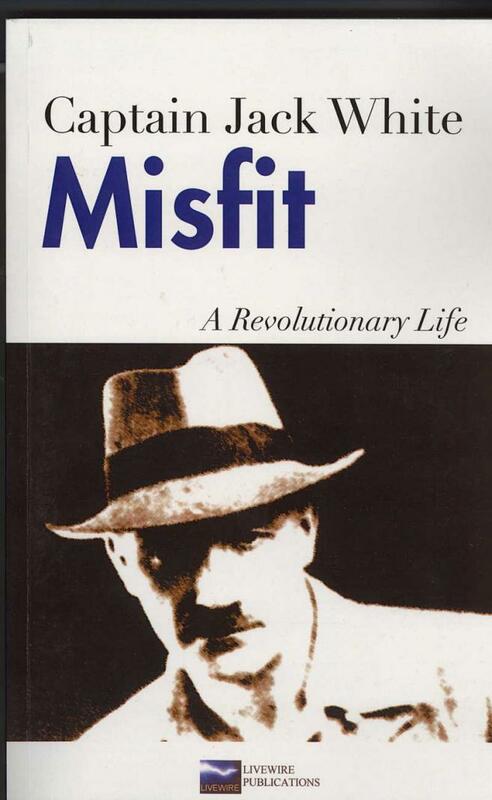 Misfit was first published in 1930. By the time I was born in 1942 copies were already quite rare. My own copy was literally that, almost half a ream of A4 paper laboriously copied for me by Cork historian Kevin Doyle. So it was a delight to see the book re-published inclusive of some of my father’s essays on anarchism, the church and Spain at the time of the Civil War. With the luxury of being able to slip the book into my pocket instead of the fear of the wind scattering the work over several counties, I read the book with renewed focus. What must be clear at the outset is that I was not yet four years old when my father died in 1946. My personal memories are few and though there has been a wealth of family anecdote, I cannot claim to have known the man. My mother, Jack’s second wife, died some thirty years ago and it is a source of great frustration to me that I cannot compile a long list of questions to put to them both. What I wouldn’t give to be left alone with my father in a quiet room with a bottle of whiskey and two comfortable chairs. My first admission is that I am not convinced I would have liked the man. Respect, yes; admiration for some qualities, certainly - but like? I have my doubts. I feel sure we would have argued ferociously on several counts though we would have shared total agreement on many others, mainly to do with politics. The prevailing reaction to Misfit is the feeling that the man had a level of self-assurance so far off the scale that in many cases it could only be described as arrogance. Even allowing for his station in life, his presumptuousness could be breathtaking. Granted he was the eldest son of the big house, modestly known as Whitehall. His mother, Lady White doted on him, as did his three younger sisters. He was educated at Winchester where he was constantly disciplined for renegade activities including urinating openly while fielding on the cricket pitch. His father, General Sir George White, was asked to ‘remove’ him after an accumulation of black marks, but with his background other doors opened with ease. Sandhurst awaited and the life of a British Army officer. At Sandhurst his fiercely independent spirit continued to land him in trouble but his father’s influence protected him from being rejected. His courage and his profound sense of fair play were proven in the Boer War where his father was garrison commander at Ladysmith. While storming a hill at Magersfontein he came across a wounded teenaged Boer sniper. A Captain Turner, catching him up was all for shooting the boy. White pointed his pistol at his fellow (and senior) officer and said ‘If you shoot him, I’ll shoot you’. His bravery at Magersfontein and other actions was recognised with the award of a DSO, though it was understood within the family that my father believed the medal was a form of bribe to ensure the pistol incident remained hushed up. My socialist heart feels that the act of confronting a senior officer with a gun to save a wounded enemy more truly merited the medal than the less easily quantifiable actions in the field of battle. General Sir George was appointed Governor of Gibraltar in 1900. Jack was sent to join him as his ADC in 1902. There he lived the life of Riley. He, with his mother’s guidance, sent out invitations, wrote menus, raced horses, played polo and met the aristocracy of Europe including the Kaiser, plus other onerous tasks such as dancing ‘with the plain women’. He was allowed free forage for two horses but “I kept four” he writes without a hint of embarrassment. In Gibraltar he met a local beauty, Dollie Moseley, whom he was later to marry. One cannot fail the get the impression that his desire for Dollie had more to do with his own vanity than any depth of love for her. Later in the book he writes to his mother as ‘my darling mother’ and to his wife as ‘my dear Dollie. When Dollie breaks off the engagement (twice) the emotion conveyed most strongly is more of his hurt pride than that of a broken heart. Jack received Dollie’s first rejection when in India. Denied leave by his regiment, he saddles up and rides some fifty miles to see the CinC India, General Kitchener. Arriving at 6 a.m. he is met at the CinC’s residence by General Birdwood, Kitchener’s military secretary. Most junior officers would be terrified of attempting such insubordination. Birdwood was ‘friendly and helpful’ and invited him to join Kitchener at breakfast. The fact that Jack’s father had occupied the same house during Sir George’s period as CinC and his sisters had lived there clearly gave Jack an entrée denied to lesser mortals. That he should presume to exploit that position is just one measure of his overwhelming self-assurance. Kitchener gives him leave over the head of his C.O. – unthinkable in normal army protocol. After a long and complicated pursuit of Dollie he finally wins her back, at Plymouth, and he returns to India. No mention is made of their conversations, not a word about joy, passion, tears, embraces and all the emotional baggage that is part and parcel of being in love. He returns to India with a tone of ‘done that’ or ‘mission accomplished’. After the army Jack, like many servicemen, has no sense of direction. He experiments with just about every known ‘ism’ - socialism, communism, republicanism, nationalism, vegetarianism, pacifism and anarchism. His theories on life are ill-formed and uncertain. He exchanges letters with HG Wells, Tolstoy and other luminaries of the time; he tries the life of a tramp, living in a commune, ranching and lumberjacking in Canada, a railway official in Vancouver, teaching English in Bohemia and others. His parents at one point pay for him literally to have his head examined. The physician, Sir Victor Horsley, finds an ‘unusual cranial configuration’ and wishes to remove it surgically. Jack declines. Throughout his wanderings he seldom mentions Dollie. She reappears at Slindon in Sussex where they attempt to run a poultry farm. The farm is not a success, Dollie falls ill '‘and returns to her people in Gibraltar’. No other comment. With Jack’s return to Ireland there is an inevitability that this firebrand of a man will get involved in Irish politics. Though he was decidedly anti-Catholic he had none of the bitter bigotry so common in Ulster. His convictions were purely intellectual. He found the man-made additions to Christianity non-scriptural and wholly objectionable. Limbo and Purgatory were a nonsense manufactured by a hierarchical and possessive church the better to keep its flock in thrall. The Assumption was quite illogical. What possible use would Mary’s terrestrial flesh and blood be in a celestial paradise where ‘eye hath not seen nor ear hear what things God had prepared for those that love Him’. How dare any human being be declared infallible. How dare any church add to the Ten Commandments, six of its own. My late brother Tony remembers my father taunting my Catholic mother about the ‘biscuit’ which purported to be the actual body and blood of Christ. The very ethos of Protestantism where man was answerable direct to his Maker conflicted with Catholicism with the Confessional, its monarchical hierarchy, reverence to shrines, medals, pictures, statues, crucifixes and saints. Jack’s first political foray in Ireland was to hold a meeting to condemn the ‘lovelessness and lawlessness’ of Carson and his movement which threatened armed resistance against Asquith’s Home Rule Bill, (the embryonic UVF). Any question of White’s courage would have been dispelled by his holding an anti-Carson meeting in Ballymoney in the centre of Orange County. His politics were very much of the old 1798 United Irishmen school of Wolf Tone and other great Irish Protestants. Ballymoney led to an invitation to speak at the then National University in Dublin.. Sharing the platform were John Dillon, Tom Kettle and other prominent nationalists. But nationalism was not to prove the motivating force for Jack White. It was the appalling conditions of the poor in Dublin’s slums that fired him to anger and action. The great strike of the Dublin Transport Union began in August 1913. The condition of the poor deteriorated to the point where people were close to starvation and many deaths were the direct result of malnutrition. As in the famine of 1845-48 the Crown did nothing. Worse, the forces of the Crown baton charged strikers and supporters where in one attack no fewer than 479 citizens were injured by brute physical violence. In fairness, it was not just the fault of the Crown, the Dublin bourgeoisie tended to look down their noses at the poor and many identified more with the Protestant establishment than with their own people. Witness the after-event of the 1916 Rising when the insurgents were spat upon by fellow Irishmen as they were marched away. There was a widespread coterie of Castle Catholics who found familiarising with the British establishment more congenial and beneficial than keeping to their own. The foregoing resulted in the foundation of the Irish Citizen Army, founded jointly by Jim Connolly and White with Sean O’Casey holding the post of secretary to the ICA.. White was on intimate terms will the prominent figures of the period including, Larkin, AE, Horace Plunkett, Casement, Sheehy Skeffington and Countess Markievitch (too intimate with her, my mother used to say). White’s resignation from the ICA was primarily to do with the direction the ICA was taking. His fervent support of the ICA and his dedication in training the men, even buying them boots from his own pocket, was because of its socialist ethos. When the Volunteers were formed, their nationalist ethos began to appeal not only to the wider public but also to the members of the ICA. Though not anti-nationalist White felt the priorities were being skewed. He eventually resigned for this reason but also, as he admits in Misfit, because his personal vanity was offended. With the outbreak of WWI Jack had to be involved though by this time he was a pacifist. He chose to join an Australian Ambulance Unit, driving his own converted car to France. Dollie reappears for a flash working with him as a nurse in Paris. Shortly afterwards she declares ‘we are a couple of frauds’ and without further comment we are told she ‘went back to her people in Gibraltar’. The Rising of 1916 brought him back to Britain where he, very naively, attempted to bring Welsh miners out on strike in support of the condemnation of Jim Connolly’s death sentence. As Wales had proportionately just as many soldiers at the front as England, the disruption of coal supplies to British shipping was not a popular cause. Jack winds up in jail and shortly afterwards is transferred to Pentonville to complete his sentence for sedition. He arrives at Pentonville the night before Casement was hanged. This is where Misfit ends. For interested readers White shifted further leftward at the 1918 Russian Revolution and he was jailed in Dublin in 1920 and Edinburgh in 1921. In 1922 he was proposed as a Worker’s Republic candidate in the Free State election. He later withdrew claiming he was a Christian Communist. In the 1930s he was active in the Revolutionary Workers Party in Belfast. In 1931 he was involved in a bitter battle between the RUC and a march of unemployed workers. He was jailed again and under the 1922 Special Powers Act he was excluded from Northern Ireland except the district of Limavady (why Limavady is not known). In 1934 he took part in the Bodenstown march to commemorate Wolf Tone. Shamefully the IRA prevented a Protestant contingent from the Shankhill Rd from joining in. 1936 saw him travel to Spain to join the anti-Franco forces. A year later he was back in Britain working for the cause Spain and the World by writing pamphlets and fund raising in London. There he met my mother. Though a devout Catholic my mother married my father in a registry office and my older brother Tony was born technically illegitimate. What happened to the marriage with Dollie is undocumented. In 1938 he returned to the family home, Whitehall, his mother having died in 1935. Little is known of any political activity thereafter apart from his proposal to stand in the 1945 election as a Republican Socialist. It came to nought and he died of cancer in 1946. His other remaining son, Alan, lives in Durban. Jack White was fiery, stubborn, at times arrogant and sometimes violent but he was astonishingly brave and devoid of pettiness or grudges. His arrogance might have been checked had he been given serious dressing-downs in earlier life. But who was to do it? Doting mother, junior sibling sisters, fellow officers all too aware his father was a Field Marshal with five knighthoods? Other men? Very few would disregard his broad 6ft 3 frame. He was a political dilettante. Like Browning’s Last Duchess who Liked Where Ere She Looked and Her Looks Went Everywhere, he was drawn to causes like a duck to water. Yet he can not be faulted for sincerity. No man who can take on the RIC’s finest and get clubbed, almost to death, while throwing punches, can be called an armchair activist. No man suffers regular imprisonment for pleasure or vainglorious reasons. He was anti-Catholic yet married two. He was pro-Unionist yet loathed Carson’s unionist bigotry. He was part of the British Protestant establishment but proudly called himself an Irishman. He came from a privileged background yet threw in his lot with Dublin’s poor. A paradox, a one-off, a misfit. What I wouldn’t give for that quiet room, a bottle of whiskey and two easy chairs.